Norfolk Southern Grand River Bridge - The Great Lakes Construction Co.
Norfolk Southern Railway selected The Great Lake Construction Co. to build a new bridge in Painesville, Ohio to carry rail traffic over the Grand River replacing the existing structure built in 1904. The new bridge consists of 11 spans and is 1,318 feet in length. The substructure includes 10 concrete piers founded on 7-foot diameter drilled shafts. The 26 drilled shafts are between 34 and 93 feet in depth, which includes the rock socket extending into the existing shale. The new piers are made up of 6-foot diameter columns with 8 of the piers also containing reinforced concrete struts to connect the columns. The piers are up to 71 feet in height above the top of drilled shaft elevation. The detailed form work drawings were developed by Great Lakes’ in-house Engineering Department. The 10-foot high steel girders were erected in pairs with the longest spans measuring 180 feet. Two 300 ton capacity cranes hoisted the 230 ton paired girders into place. The new deck consists of precast concrete deck panels tied down to the girders. New steel walkways and inspection grating platforms were added to the bridge for use by Norfolk Southern Railway maintenance crews. On each side of the bridge, Great Lakes built the 2,000-foot approaches consisting of excavation, embankment, drainage, and sub-ballast for the new track alignment across the new bridge. Great Lakes and Norfolk Southern Railway have enjoyed a good working relationship with both companies placing a heavy emphasis on the importance of safety and environmental protection to the river and sensitive surrounding area. Click HERE to view a time-lapse video showing construction progress! Courtesy of Brent Lane Photography. 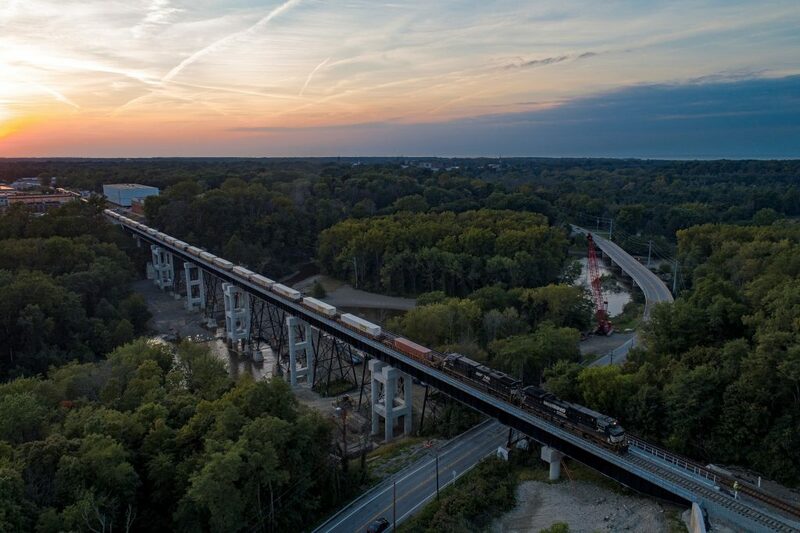 The first train crossed the new Norfolk Southern railroad bridge in Painesville, Ohio on September 30, 2018!